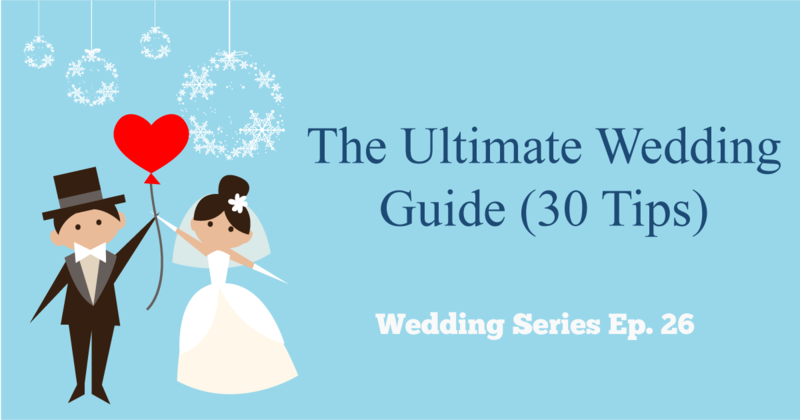 When planning your wedding, there are things that are nice to know, and there are things you need to know. Advice so essential any bride who’s lucky enough to hear it thinks, “I’m so glad someone told me that!”. If you’re wondering whether there’s something you may have missed (or even if you’ve got everything under control), check out our indispensable planning secrets below. Get a grip on the approximate number of guests you’ll invite before settling on a venue. This will ensure there’s ample space for your crew. As a rule of thumb, allow for 25 to 30 square feet per guest. That may seem like a lot, but it’s really not if you count the space you’ll need for the tables, bustling waiters, the band and a dance floor. Heed the weather and other potential annoyances. Guests have been known to skip out early from hotter-than-hot summer tent weddings and improperly heated winter loft receptions. Bugs (gnats and mosquitos) also swarm in certain areas during certain seasons. Consider renting pest control tanks to alleviate the problem or including bug repellent in guests’ gift bags. And if you want a sunset ceremony, make sure you know when to say your vows by checking SunriseSunset.com. Oh, and always, always have a Plan B for unexpected weather snafus. Another unforeseen expense? Feeding your wedding day crew. Before you sign the contracts, make sure you’re not required to serve the same meal to your vendors that guests will receive. Otherwise, you could be paying for 20 additional lobster tails. Choose a less expensive (but equally hearty) meal for them instead. You will have to let your wedding caterer know a couple of days before the wedding exactly how many vendors you need to feed (don’t forget photography assistants and band roadies) and what you want them to serve. For on-the-go planning that keeps everything in one place, download a Wedding Planner app to keep all of your planning info digitally on-hand at all times. Your wedding budget should follow this formula: 48 to 50 percent of total budget to reception; 8 to 10 percent for flowers; 8 to 10 percent for attire; 8 to 10 percent for entertainment/music; 10 to 12 percent for photo/video; 2 to 3 percent for invites; 2 to 3 percent for gifts; and 8 percent for miscellaneous items like a wedding coordinator. It’s essential to allocate an extra 5 to 10 percent of your money for surprise expenses like printing extra invites because of mistakes, additional tailoring needs, umbrellas for a rainy day and ribbons for the wedding programs. Also, don’t forget the Limo or Party Bus! Your wedding vendors should be your go-to, most-trusted experts during the planning process. When working with them, you should feel free to really explore what it is you want—maybe it’s serving a late-night snack instead of a first course or doing a bridal portrait session rather than an engagement session. The bottom line is that you should feel like you can have an honest conversation with them about what it is you want. Their job will be to tell you what you can and can’t make work given your wedding budget. Of course you want the perfect stamps for your wedding invitations. But not all stamps are widely available at every post office, especially in large quantities. Save yourself scouting time by ordering them online at USPS.com. And be sure to weigh your invitation and all the additional paper products before you send them out so you can attach the right amount of postage. Ask your stationer about the need for additional postage for oddly shaped envelopes. You have four choices: You can welcome children with open arms; you can decide to have an “adults only” wedding; you can include immediate family only; or, you can hire a child care service to provide day care either at the reception space, in a hotel room or at a family member’s home. To prevent hurt feelings, it’s wise to avoid allowing some families to bring children while excluding others (unless, of course, the children are in your bridal party). Pare down your guest list with the “tiers of priority” trick. Place immediate family, the bridal party and best friends on top of the list; follow with aunts, uncles, cousins and close friends you can’t imagine celebrating without. Under that, list your parents’ friends, neighbors, coworkers and so on. If you need to make some cuts, start from the bottom until you reach your ideal number. If your guest list is bursting at the seams, assess the plus-one scenario. Do a faux seating chart in your mind and imagine whom your single pal would sit with. If it’s a table of singles that she knows pretty well, then you’re all set. If it’s a table of couples (making her the odd one out) or if it’s a table of singles where she won’t know anyone, consider bending the rules. If asked why you’re not allowing single friends to bring guests, size or budget constraints or your parents’ never-ending guest list are always good reasons. As soon as you’ve picked a date, start to look for hotels in a wide variety of price points. Many hotels allow you to reserve rooms for guests under a special wedding block and a reduced rate. You can then release any unbooked rooms a month prior to your wedding. If the hotels you contact insist upon contracts with cancellation penalties, just say no—you don’t want to be responsible for rooms you can’t fill. You can check your state’s license requirements online but confirm with a call to the county clerk’s office to see when they’re open. Even if it’s open from 9 a.m. to 5 p.m., they may issue marriage licenses only during slower times like, say, Thursdays from 2 p.m. to 3 p.m.
Give a copy of your marriage license to your mom or your maid of honor (just in case you lose yours during the final days before your wedding). Wedding budgets are all about balance. Start your budget planning by making a checklist of the crucial details, like the music, your wedding gown, the invitations, the flowers, the limo and the photographer, and assign a number to each—one being the most important and three being the least. Make sure your guests can both see and hear from their seats. If people are seated farther than 15 rows back from your ceremony altar or podium, consider renting a mic and a riser. This could range anywhere from $50 to $100, depending on the equipment used. You’ll need to coordinate the delivery and setup with your ceremony space, so put your wedding planner or best man in charge of this task. Keep an emergency contact sheet or phone with your vendor contacts on you on your wedding day—it may come in handy in case your limo driver needs to pick up that crazy aunt last minute or you decide you’d like your photographer to take some behind-the-scenes shots. When it comes down to the last month of your planning (and when you’re particularly harried) look at your mile long to-do list and cut three things. Yes, cut three things. Not crucial things you just don’t feel like doing, such as picking a processional song or confirming final details with all of your vendors. Eliminate only the over-the-top tasks like hand-painting “Just Married” signs, or baking cookies for all of the welcome bags. Cross them off and make a pledge not to think about them again.